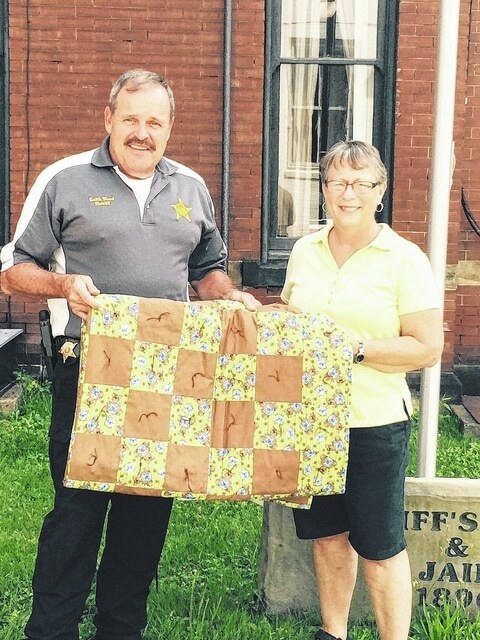 Sheriff Keith Wood and Karen Walker with one of the quilts created for kids through the C.A.R.E. program. POMEROY — A new program community, C.A.R.E. (Community Action Raising Encouragement), is emerging in Meigs County. The project, which is community-driven, has been set up to aid children in times of need. Meigs County Sheriff Keith Wood said Monday that the sheriff’s office, along with other local police departments and first responders, will take another step in stressful moments for a child who is a victim of crime. “Many times, the most difficult situation for a child is coping with a critical incident, and we as law enforcement are with them to provide comfort when that child is scared,” Wood said. C.A.R.E. packages will also be given to any child involved in a critical incident. The packages will include a quilt, a stuffed animal, crayons and writing paper and other items to help calm a child. Racine United Methodist Church has donated several child-size quilts and the Career Based Intervention Class from Meigs High School has donated stuffed animals to help start the C.A.R.E. program. Karen Walker is part of the Helping Hands Program at Racine United Methodist Church and said she hopes the quilts will help comfort a child in need. Wood encourages any interested organizations or individuals to donate non-perishable items, including crayons, other writing materials and anything a for a child that can go in the C.A.R.E. packages. “We live in a great county, and the local community shows support so many times by stepping up and becoming involved with a tragic moment,” Wood said.